Metro is working in tandem with several community revitalization efforts in the area, a number of which are spearheaded by the Los Angeles County Department of Public Works , to complement significant local streetscape and development investments and build a revitalized gateway into and for the Willowbrook Community. This revitalized regional facility will provide thousands of Metro patrons with superior access to local treasures and amenities, including the County’s most advanced health care services provider, the rebuilt Martin Luther King Jr. Medical Campus, and the Charles Drew University of Science and Medicine. We’ve been hard at work gathering input from the Willowbrook community and Station users, and making significant progress on the new design. Feedback received through community meetings, pop-up events, and a Green and Blue Line platform survey has played a significant role in shaping new design opportunities to create a more efficient and welcoming Station and community plaza. Additionally, in January 2017, Metro partnered with local community organizations to complete a walk audit of the Station and surrounding area to highlight opportunities for multi-modal access and connectivity improvements. This audit was one of 22 conducted as part of the Metro Blue Line First/Last Mile Plan and, in addition to developing guidance for accessibility improvements to the Station, will generate program recommendations for the Metro Bike Hub in the new community Plaza. Stay tuned for additional opportunities to let Metro know how to make getting to and from Willowbrook/Rosa parks Station easier, as well as how we should program the new Bike Hub to create a true mobility resource for the community. Metro reached out to patrons on both the Green and Blue Line platforms by surveying and asking them to share their thoughts on how to best redesign the station to improve circulation and community connections, as well as increase capacity and safety. A summary of those findings is available here . Previous studies of patron usage data collected from fare gates and TAP card validators at the Station revealed that at least 88 percent of station users are rail-to-rail transfers. To supplement the input collected through community outreach, the survey captures the perspectives of passengers who currently may not leave the Station as they transfer between the Green and Blue Lines. 1) When will construction begin/end? When will the project open? Construction is anticipated to begin in spring 2018 and continue through late 2020. To maximize passenger service and security, as well as minimize impacts on transit operations, the project will be constructed in phases. Some improvements will be available and running before full project completion. 2) What kind of delays will construction cause to station service? How will I park and/or catch the rail/bus during construction? Project phasing has been designed to ensure safe and convenient access to the station and minimize service interruptions during construction. However, as this will include work on and around the station, there will be some temporary adjustments needed to ensure public safety and maintain train and bus operations. Significant advanced notice will be posted on this webpage, at the station, and in community facilities in regards to these adjustments. 3) Will Metro be maintaining wheelchair access during construction? ADA-compliant access and patron safety are of prime importance to Metro. Both will be maintained throughout construction. 4) Will the project permanently alter current bus service at the station? This project does not propose a change in service to Metro or municipal bus lines that currently begin, stop, or terminate at this station. However, during construction, bus stops are likely to be temporarily relocated to a nearby location to maintain patron, bus driver, and construction worker safety. 5) Why is Metro redesigning the bus bays? An analysis of bus routes and passenger uses shows greater efficiencies if most bus operations are consolidated into one main area. The project reconfigures bus bays on Willowbrook Avenue West, adjacent to the new community plaza, to create a consolidated and intuitive transit space for bus patrons. Most bus services serving this station will soon stop on Willowbrook Avenue West, a few feet from and in direct view of the reconfigured east park and ride lot, new pick-up/drop-off zone, and new Bike Hub and Customer Service and Transit Security Center at the plaza. 6) How does extending the Blue Line platform and mezzanine improve the station? Extending the Blue Line platform south of the I-105 will increase visibility by bringing more of the station out from under the freeway overpass and provide a direct visual and physical connection to the new community plaza and consolidated bus bays. In addition, obstructions on the platform itself, such as stairs, elevators and escalators will be reconfigured to reduce crowding and make it easier to get from one end of the platform to the other. A new modern canopy will provide shade for patrons waiting on the platform. The mezzanine that connects the Green Line to the Blue Line will be expanded and reconfigured to simplify the path of travel between the two platforms levels. The new mezzanine will be brighter and more spacious, and will include upgraded stairs and elevators, and a new escalator. 7) Will fare gates be installed at every entrance? Yes, the proposed improvements at the Willowbrook/Rosa Parks Station will conform to Metro’s current design standards, which require gating at station entrances. 8) Are you adding or taking away parking? The east Park and Ride lot is being reconfigured to improve safety and access by adding a new pick-up/drop-off zone, but the amount of patron parking spaces is expected to remain approximately the same. In addition, Metro has coordinated with LA County to ensure that a new crosswalk is constructed across Wilmington Avenue to provide safer and more direct access between the west Park and Ride lot (which today is no more than 50% occupied throughout the day) and the upgraded station. 9) Are you going to start charging for parking? This project does not propose to charge for parking. However, Metro is in the process of implementing a system-wide Supportive Transit Parking Program Master Plan, which may introduce a paid parking program to better manage parking demand at the Willowbrook/Rosa Parks Station. More information on this program will become available in the next year at metro.net/riding/paid_parking/. 10) Will art be included as part of the improvement project? Artist team Jamex and Einar de la Torre and artist George Evans were selected by a community-based panel to create new site-specific artworks for the station. The artists will develop integrated artworks that are guided by research and community engagement, explore the legacy of Rosa Parks and the memory of the civil rights movement, and offer a vibrant, bold and uplifting complement to the station improvements. To learn more about the Metro Art Program and sign-up to the mailing list, please visit metro.net/art . 11) How is Metro improving access to the station? Multi-purpose plaza: A new community plaza at the station will serve both as a shared community space and provide a safe and direct link to the extended Blue Line platform, consolidated bus bays, and reconfigured east Park and Ride lot, as well as Wilmington Avenue. The plaza will house a new Metro Bike Hub and Transit Security and Customer Service Center. Mid-block promenade: A new pedestrian promenade will traverse the Kenneth Hahn Plaza parking lot from Wilmington Avenue to the new station plaza and establish a welcoming and clear physical connection to the station from the nearby employment hubs, schools, and health service providers. Southern platform crossing: A new community rail crossing will replace the existing crossing to connect to the south end of the extended Blue Line platform. The widened crossing has been designed with the latest crossing technology to improve safety, visibility, and pedestrian access. This will be a through crossing, allowing the community to safely traverse the tracks while providing plenty of cueing space for the new fare gates at the south end of the platform. The existing pedestrian crossing to the north of the station platform will be reconfigured as an emergency exit onto Willowbrook Avenue East. Bicycle cycle track: In partnership with the LA County Department of Public Works, Metro will be adding a curb-separated bicycle path along Willowbrook Avenue West, stretching from 119 th Street to Wilmington Avenue. 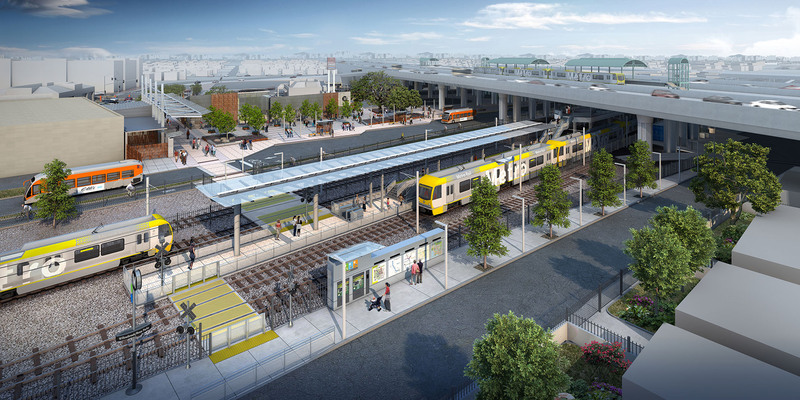 This infrastructure builds on the station’s status as the fourth busiest in the Metro Rail system and enhances existing multi-modal elements by connecting to significant area streetscape improvements being spearheaded by the LA County Department of Public Works. More information on the streetscape improvements may be found here . Wilmington Avenue crossing: In addition to the cycle track, Metro and the LA County Department of Public Works have partnered to construct a new crossing at the intersection of Wilmington Avenue and the I-105 freeway on-ramp/off-ramp, connecting the west Wilmington Avenue sidewalk to the Kenneth Hahn Plaza on the east. This crosswalk will provide much-needed and direct pedestrian access from Metro’s west Park and Ride lot, local employment hubs, schools, and health service providers, as well as new residential projects on the west side of Wilmington Avenue to the station. 12) What is Metro doing to increase security in the redesigned Station? Transit Security Center and security surveillance: The new Willowbrook/Rosa Parks Station community plaza will include a Transit Security Center oriented and designed to maximize eyes on the plaza, bus bays, parking lot, and extended Blue Line platform. This state of the art facility will house security office space, surveillance technology, and a new customer service window. New cameras will also be installed throughout the station and supplement existing safety patrol presence. Open layout design: The open-air plaza maximizes lines of sight to and from the platform and bus bays, and provides direct connections to the surrounding community. These improvements will make navigating through the space a more comfortable, intuitive, and safer experience. Enhanced lighting and acoustics: Existing lighting elements are being significantly upgraded, new LED lighting components are being installed, and higher acoustical standards are being incorporated into the redesign. 13) What is a Metro Customer Service Center? What resources does it provide? A Metro Customer Service Center offers a variety of services to Metro riders. Patrons can obtain timetables, plan trips, provide feedback, purchase TAP cards and submit applications for reduced fare TAP cards (e.g. Senior or Student cards) at the Centers. 14) Why place a Customer Service Center at the Willowbrook/Rosa Parks Station? Currently, there are a limited number of Customer Service Centers located throughout the Metro system. Providing a Customer Service Center at the Willowbrook/Rosa Parks Station would allow Metro to better serve the communities in the southern area of the county through more convenient access via the Metro Blue and Green Lines, as well as various bus lines. 15) What is a Bike Hub? A Metro Bike Hub provides patrons new resources and facilities to store bicycles and encourages diverse means of travel from Metro stations to nearby locations. The Bike Hub may also house innovative community-supportive programs such as car share, bike share and “build-a-bike”. To learn more about Metro’s growing Bike Hub program, and to find existing Hub locations near you, visit bikehub.com/metro . To learn about our expanding bike facilities and programs, including storage lockers, Bike Share, and how to ride Metro with your bike, visit our Bike Metro webpage at metro.net/riding/bikes . 16) Will there be any bike paths added nearby? The LA County Department of Public Works is currently exploring various improvements in the Willowbrook area, including the addition of bike amenities on Willowbrook Avenue West, 119 th St, and Imperial Highway. Programmatic elements housed in the future Metro Bike Hub at the Willowbrook/Rosa Parks Station have the potential to complement and enhance these new area networks through bicycle repair, storage and retail elements. Additional information on these improvements may be found on the LA County project webpage here . 17) How is the project funded? 18) Will there be local hire opportunities? Metro has targeted hiring policies on certain Metro construction projects to encourage construction employment and training opportunities for residents from economically disadvantaged areas. For the Willowbrook/Rosa Parks Project, the targeted worker hire program will be determined with the release of invitations to bid on the construction of the Project elements. More information about Metro’s Project Labor Agreement & Construction Careers Policy is available at metro.net/pla . 19) How can I stay informed of the project progress? Willowbrook/Rosa Parks Station Improvements Project and Blue Line Upgrades webpages: Important information such as outreach events, milestones, and construction notices will be updated regularly on the Improvements Project webpage under the “Project Status” tab. Click here to read the latest news on the station Improvement Project. Metro is also performing significant safety and operational upgrades to the entire Blue Line, the oldest rail line in the system. Click here to view the latest progress on the Blue Line enhancements. Mailing List: The project team keeps an updated stakeholder list and apprises interested individuals of project updates as well as relevant Blue Line projects and initiatives. This list will be used to inform station users of construction notices once the project begins construction. Click here to join the project mailing list. Metro staff: Project staff is available to answer questions or attend meetings to update larger groups of stakeholders. For questions regarding the Willowbrook/Rosa Parks Station Improvement Project, please contact Project Manager Paul Whang at WhangP@metro.net or 213.922.4705. To learn more about the Metro Art Program and sign-up to the mailing list, please visit metro.net/art.